I built this wooden bed frame a few years ago for a twin size mattress. It served its purpose but I'm no longer using it. I've been thinking on what to do with it. I finally figured it would make a good storage shelf unit. Adding a few shelves and closing up one side, I can store all my balsa and be able to sort it by type n size. 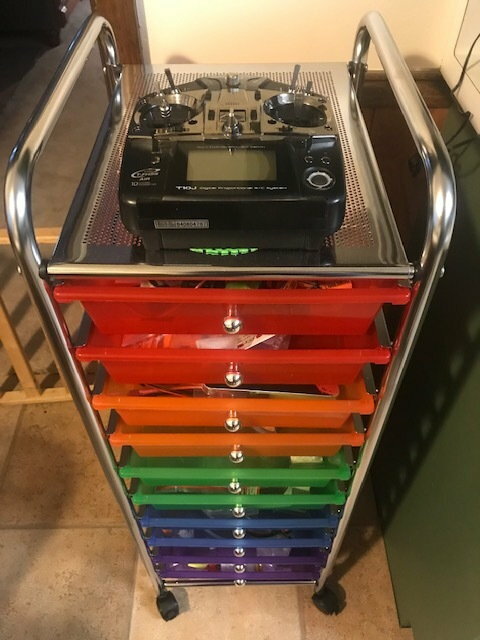 Plus I can store all, or most, of my RC supplies in one spot. For the balsa sheeting I can add a 1x4 weighted top piece to keep all sheeting flat. I will add a separate, top, shelf unit for my 48” balsa stock. I've been storing all my balsa in the shipping boxes, see picture. I've been moving them from place to place as needed. The plastic shelving units in the second picture and most of what is pictured is going to Florida. So the wooden shelf unit will be a good addition for my model building needs. Should work really well. Not sure why thumbnail posted sideways. Also pictures came out a bit large. I'm using a new cell phone for picture taking so it could be the phone. I'm building an insulated dog house. When I purchased material for the dog house I also purchased material for the shelving unit. I got some hardboard to enclose the back side and 1x12 lumber for the shelves. I have enough for 6 shelves. I need to figure out the spacing to use. On the dog house, plus side. I have some left over material. A small ¼” plywood panel. This will make a nice face frame rail for the shelves. I may add a small raised lip to keep things from sliding or rolling off the shelf. Not sure on that. A small piece which may make a nice glue bottle holder. Plus I have a good amount of foam left over. There may be a profile plane or two in my future. Who knows. I finally got a little time to work on my shelving unit. I moved the angle brace from the mattress support rails to what will now be the front of the unit. Removing the mattress rail pieces I ran into a problem. I had forgotten that I screwed and glued the rails on. I tried to remove them as carefully as possible. But still the rails pulled some wood from the side walls. I filled in the damaged area with spackling compound. Tomorrow I will finish sand, seal and move on. So far I have shelf spacing at 3 at 10” and 3 at 15”. I will clamp in place and see how it looks. I did run into another problem. I built a storage building last year but never enclosed the rake and eaves. As a result, I now have a wasp problem in the building. I have 3 large nests and a few smaller ones. I sprayed one till I ran out of spray. I have dead wraps all over the place. I did manage to knock one nest down. This was a pretty large nest. I also noticed I left out a support brace for the truss roof. Working on the building will be a cooler weather project. We are still into the high 80’s here in East Texas. Well I got this thing finished. I added the shelves and the back. I don't like the corner angle braces but I did not want to cut new ones. KISS. They should not interfere much. I went with the 3 10 inch and 3 15 inch spacing. Balsa wood in the top 3. Everything else down below. I will add a larger shelf topside for my 48 inch stock. I did not add the plywood face frame as it would not look too good. I will leave it as is for now. Later I can add regular 1x lumber for the face frame is desired. Mini shelves in between the regular shelves may be added later. This is should work well for my needs. Brake parts cleaner is death to wasps, you just have to make sure it gets on the wasp or the nest. INSTANT DEATH. It's cheap also and it sprays quite a ways using the straw. I did not know that. Thanks for the tip! Ken, thanks for that info. I do have brake cleaner in the shop but I had already purchased some Raid. That did a number on the wasps. They dropped all over the place and I was able to drop the nests. Brake cleaner is powerful stuff. I've read on several welding forums that brake cleaner and welding is a dangerous combination. Can lead to severe illness. On the plus side. I pulled my LT-40 from the building and moved it to the shop. I'm getting it ready for its maiden flight. Finally. Ohh wow great work, Can you please how me more pics? Thanks. There really is not much more to show. Once you build it then you have to plan on how to sort your wood for easy access. I found these rolling carts and bought two. All my small hobby parts are, now, stored here. The auto shop I work in buys brake cleaner in bulk and we have these 32 oz pressure cans we fill up and pressurize with shop air. It`s always handy on the bench for when wasps start buzzing around you when it`s warm and the doors are open. Just give `em a blast and they`re dead almost before they hit the floor. Sometimes in this hobby you make a change or you make a sacrifice. My wife needed a storage shelf unit for her office. She decided this unit was perfect for her needs. So I made the sacrifice and let her have the unit. It is loaded on the truck and ready to be transported to its new location. But, also with this hobby it is good to have a Plan B. I had made a rack to suspend from the garage ceiling joists. It would hold my balsa and plywood stock; nicely divided and pigeon holed.. All easily accessible but out of the way. I never put it up because I have to haul some tall, and heavy, aircraft hydraulic jacks to use as a third hand helper. They would hold the rack in position while the install is made. . Now i have to do it. Weather is still cool for the attic work I have to do. I can’t put it off anymore. My storage needs demand it.